A friend of mine posted this on my FB wall and I thought it was something worth sharing... especially since I have a lot of friends in the blogosphere who are Wedding professionals... check this out. For more info go to Bridal Bubbly ! I saw this and it looks awesome! A bit too steep for my pocketbook right now, though. ooh i want to go to that in dallas. I’m ready to go back to class! 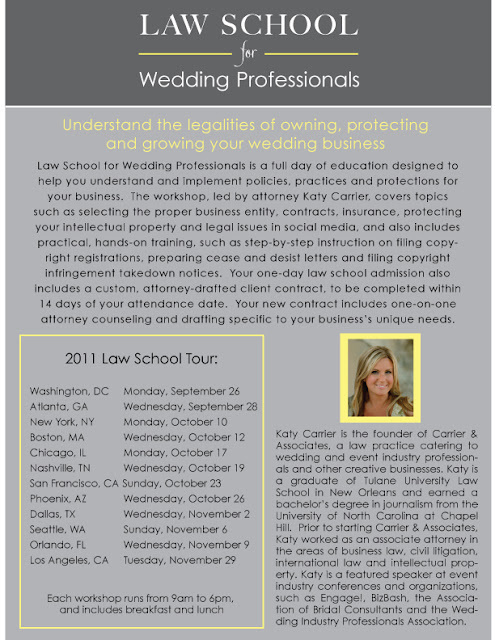 Law School for Wedding Professionals is a class that I have been waiting for all of my life! I would love to attend this class,I'm so excited! Oooh. Will check this out! This is interesting. Thanks for sharing. I will check this out. Didn't know, that something like this is needed? Thanks for the post! I'm glad I saw this. I'm planning to attend the class in LA on November 29th Hope to see you all there. Law School for Wedding Professionals Enables wedding professionals and printers included to be aware of the legalities regarding ownership of the business. I would love to learn more about how to plan Long Island weddings. A course like this would do me a world of good!